A week from today is Christmas so I know I “should” be writing some kind of joyful, uplifting post about how this is the most wonderful time of the year. And in many ways it is. But I work in a hospital so whether I like it or not I’m confronted with the fact that Christmas can actually be a very sad & difficult time of the year for many people because of sickness, accidents, mental illness, drug abuse, and of course death. My own family has lost several members over the past year & this will be our first Christmas without some very special people. I don’t mean to be depressing, but I just feel like I need to address this subject because I know I’m not the only person who is feeling very conflicting emotions at this time of year. Part of me loves all of the decorations, parties, Christmas music, & general “cheer” that the holidays bring. But part of me also feels the weight of grief in knowing that this Christmas will be a bit different than those of the past. This leads me to a greater topic that I want to address. A friend of mine recently posted something on Facebook about how sad she thought it was that some religious people believe that grieving, even at funerals, is wrong because the focus should be on the loved one being in Heaven. I was very struck by that post because I too have witnessed this sad phenomenon. I have been to lots of funerals in my life and over and over again I have heard the same basic phrases: “She’s better off now. She isn’t suffering anymore because she’s with Jesus in Heaven. Don’t despair. You’ll see her again someday.” To be perfectly honest, until my grandmother died five years ago I was quite guilty of saying some of these things myself to other people whose relatives or friends had died. However, when Granny died I realized how completely unhelpful such things are. I know that people mean well when they say these things, but standing in the line at the visitation the night before Granny’s funeral, I realized that the only words that really comforted me at that time were these: “She was a wonderful person. We all loved her so much & we will miss her forever. I’m so sorry for your loss.” I needed people to recognize that, yes, this WAS a major loss. And I had every right to feel sad, depressed, and even angry at the fact that she was gone. (To be honest I’d worked through a lot of these emotions even before she passed away because of her being on hospice for quite some time, but even so the pain of losing a loved one is never easy.) I remember going to her funeral and wanting to cry so badly but feeling like I couldn’t. Now, this is largely my own fault I suppose for not feeling comfortable enough to cry in front of my own family. How ridiculous is that? My sister wasn’t afraid to cry, but I was. I never once cried in front of my family when Granny died. I only cried when I was alone or with my now-husband (then boyfriend). There are a lot of underlying reasons for why I only felt comfortable enough to cry in front of him, and I am still working through those reasons even now. But I can’t help but feel one of those reasons was that for so much of my life I’d been inundated with the never-explicit but always strongly implied idea that grief was somehow sinful, somehow selfish. I don’t know exactly where this idea came from and I am blaming no one in particular for it. It was just there. Maybe I made it up, but I don’t think so. When I was a junior in college one of my OB nursing professors told us a very personal story about her own miscarriages and the eventual birth of her first child who was either stillborn or died within a few hours of birth. The point of the story was that there was so much grief involved with losing this child and that she had to learn to work through it. She learned that no matter how much she tried to just “move on with life” and push it away, the grief was still following her. I’ll never forget that lesson. I remember so strongly sitting in that class, thinking about how it had been a year since Granny’s death and I had done everything I could to run away from that grief because I was busy with nursing school and just didn’t want to deal with the grief of her passing. I just didn’t feel like I had the stamina to process it so I kept pushing it away. And just like my professor said, the grief kept coming back. It kept haunting me. It wasn’t until I heard her speak about how she finally learned to confront the grief, to handle it, to honor it, to accept it, to process it, that I realized how much I needed to do the same thing. My professor was so right. Grief is a process. It isn’t something that goes away overnight. 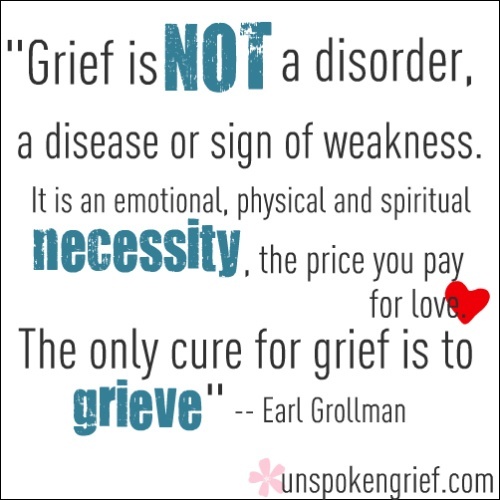 For some losses, the grief will never totally disappear, but no matter how much we feel like we can’t handle dealing with our grief for whatever reason, it will never go away at all until we start to process it. Indeed, grief will haunt you forever until you learn to really work through it. This can mean so many different things for different people (and can be different even for the same person depending on the nature of the loss). I think it’s fair to say that most people process grief at least partly through tears. I know there are exceptions to every rule, but the majority of people do cry when they’re sad. But sadness is just one part of grief. There’s so much more to it than that. Grief can encompass anger, frustration, and so many other feelings because whenever we experience a loss in life there is a part of us that wants to shake our fist at the sky and ask “Why? This is so unfair!” And quite often it is unfair. And there is nothing wrong with feeling that way! It’s just part of human nature, of experiencing life. So my challenge to myself and to anyone reading this is to really think about the losses you’ve experienced in life, especially any unresolved grief that might come back to haunt you at Christmas, this time of year when memories can seem stronger than ever. And instead of trying to just forget it or push it aside, really confront that grief. Begin to process it. Sometimes we think we’ve moved past a loss only to realize months or even years later that the wound is as fresh as ever. And that’s ok too. We just have to find ways to process our grief. For some of us that means listening to music or reading a book or writing a poem or song. For some it means seeing a therapist or counselor. There’s no right or wrong answer here. The point is that we need to be honest about our grief. We can’t try to hide it or deny it. 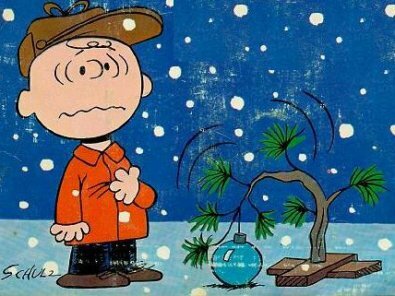 As families and friends we need to support each other and not be afraid to show our “weaknesses.” If this is your first (or second or tenth) Christmas without a loved one, don’t be afraid or ashamed to cry or just not be as “jolly” as perhaps you usually are. It’s ok. Just be honest with yourself and your family and friends about your grief. You never know who else may need your encouragement to process their own grief as well. I hope this post wasn’t too depressing but it’s something I’ve been thinking about a lot this year and felt like I needed to write for my own sake as well as hopefully to encourage others. Merry Christmas & Happy Holidays to all my lovely readers!